It should be noted that this formula is based on data from untrained individuals exercising at relatively low power outputs. In my experience, however, on average it appears to apply just as well to trained cyclists. Thus, for the present purposes there seems little reason to use another formula unless data are specifically available regarding a given individual’s economy, i.e., their actual VO2 vs. power relationship is known. VO2max sets the upper limit to aerobic ATP production, so quite logically there is generally a very good correlation between a person’s VO2max and the highest power they produce during an incremental exercise test continued to fatigue. Indeed, such testing is usually conducted specifically to determine VO2max (via direct measurement of respiratory gas exchange), and the highest power maintained for 1 min during such a test is sometimes referred to as maximal aerobic power, or MAP (especially in the UK and Canada). In reality, however, due to the contribution of anaerobic metabolism sufficiently-motivated individuals typically achieve a power output during such tests that is significantly (i.e., 10-15%) higher than the minimal power that would elicit VO2max. In fact, this must be the case for the classic plateau in VO2 that defines VO2max to occur. Unfortunately, however, the precise contribution of anaerobic energy production varies not only between individuals, but also with rate of increase in power during such tests. As a result, the precise relationship between MAP and the minimal power required to elicit VO2max also varies, which tends to undermine the accuracy of any estimates of VO2max based on such testing. As an alternative to the above, one could use the average power during a maximal, steady effort lasting approximately 5 min as an estimate of the minimal power elicting someone’s VO2max. The assumption in this case, obviously, is that the duration chosen (whatever it happens to be) represents the maximal duration that individuals can be expected to exercise at precisely 100% of VO2max. As with the approach described above, however, differences between individuals in their ability to generate energy anaerobically complicate selection of the appropriate duration. Specifically, while a cyclist with a low anaerobic capacity might only be able to maintain this intensity for much less than 4 min, another with a high anaerobic capacity could sustain it for well over 6 min. Again, the variable contribution from anaerobic energy metabolism tends to restrict the accuracy with which VO2max can be estimated using this method. When faced with the task of minimizing the time required to ride just a handful of kilometers from a standing start, e.g., when racing a short, flat prologue TT or a pursuit on a track, experienced cyclists will typically start out at a significantly higher intensity than they can sustain for the entire distance, especially during the initial acceleration phase. After they have “burned through” their anaerobic energy reserves, however, they then typically settle into a steadier, “pay as you go” pace calculated to result in essentially complete exhaustion just as they cross the finish line. The resultant power profile therefore shows an initial spike followed by a more gradual decay to a plateau or quasi-plateau in power after 1.5-2.5 min (depending on the individual’s anaerobic capacity). As would expected based on physiological knowledge, in my experience this quasi-plateau in power typically corresponds quite closely with that individual’s power at VO2max. Two examples supporting this contention are shown in Figure 12.8 on page 247 of the 2nd edition of our book, with two more examples shown below. The advantage of this approach, then, is that it works regardless of the individual’s anaerobic abilities, as everyone, no matter how gifted/highly-trained in this regard, must eventually reduce their power to a level that can be generated fully aerobically. It does, however, require that the cyclist be capable of pacing themselves appropriately so as to minimize their time (maximize their average speed) for the distance. If they don’t start out hard enough, they may not fully deplete their anaerobic capacity before the end of the test, leading to an overestimation of their power at VO2max. On the other hand, if they start out too hard, which is a far more common mistake to make, the greater muscle fatigue will result in their power decaying steadily throughout the test, resulting in the power at the end of the effort underestimating their power at VO2max. 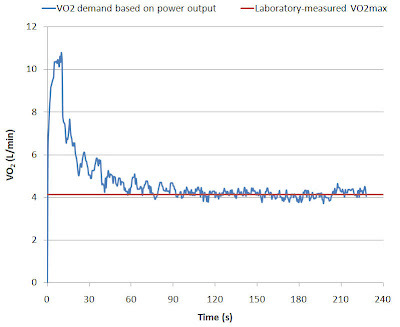 Estimating VO2max from power data: why bother? 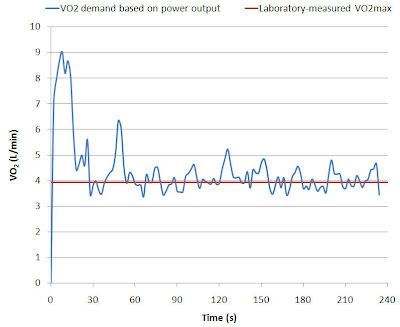 Since it is the actual power that a cyclist produces that propels them forward, regardless of how it is generated (i.e., aerobically or anaerobically), the above discussion begs the question, why bother attempting to estimate VO2max from power data in the first place? Indeed, in many cases knowing a person’s actual VO2max (versus, say, the power they can produce for 5 min) merely serves to satisfy innate curiousity. There can be situations, however, that quantifying (or at least estimating using the above method) VO2max can be useful. For example, comparison of a rider’s VO2 at functional threshold power to their VO2max (especially across time/seasons) can provide insight into the extent to which the former ability has been maximized, and thus help guide training decisions. As well, an estimate of VO2max may be useful in adjusting training or racing (pacing) strategies when traveling to altitude (or from altitude to sea level). While such decisions can be made based simply on “raw” power data, being able to differentiate the aerobic and anaerobic contributions to, e.g., a maximal 5 min effort means that they can be made more confidently. How does your observation there compare to the work of Anni Vanhatalo published in 2007 and 2008 showing that the endpoint power of a 3 minute all out test (similar to what you outlined) doesn't differ from critical power. Which of course doesn't exactly mean they are the same. Perhaps there's a difference in these two circumstances I am missing. Man, I should obviously check for comments more often! What "power" does the ACSM use in their calculations? FTP? 5 min normalised? etc etc..